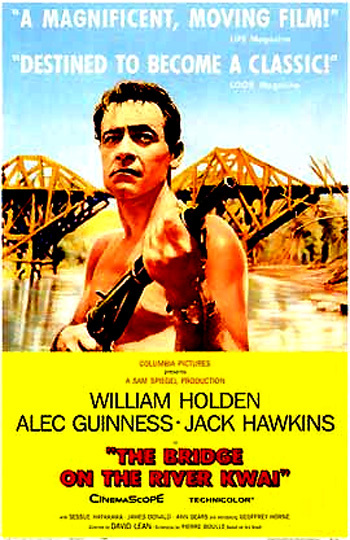 The film was the number one box-office success of the year (the highest grossing film) and it won critical acclaim as well - eight Academy Award nominations and seven Academy Awards: Best Picture, Best Actor (Alec Guinness), Best Director, Best Screenplay Based on Material from Another Medium (Pierre Boulle), Best Cinematography, Best Score, and Best Film Editing. Only Sessue Hayakawa, a former silent screen star and one of the first important Asian stars, who was nominated for his Best Supporting Actor role as the hot-tempered Japanese colonel, lost. The film created an additional stir when it debuted on ABC television on September 25, 1966. The date was dubbed "Black Sunday" due to the loss of business at movie theatres on account of its popular airing. Shot on location in the steamy, colorful, dense tropical jungles of Ceylon (Sri Lanka), the story's theme is the futility and insanity of war, and the irony of British pride, viewed through the psychological, confrontational struggle of imperialistic wills between a proud and rigid British and Japanese Colonel. The two protagonists are symbols of different, opposing cultures, but actually they share much in common - egotistical pride, dedication, a belief in saving "face," and stubborn, inflexible obedience to their class, military codes and rules. With an all-male lead cast, themes of heroism, pride, military tradition, hierarchy, and power are masterfully interwoven into a plot that is ambiguous enough to allow for various viewpoints and perspectives. Before and during the title credits, an evocative opening shows a single soaring, circling hawk, free from restraints. The aerial camera view pulls back to reveal a vast, green, and steamy tropical jungle (from the hawk's point of view), then descends into the teeming, chattering, and dense underbrush of the forest to pan by a row of crude graveyards (in the jungle and next to train tracks), marked with makeshift wooden crosses. A train with a machine-gunner on top whistles as it roars past the graves, coming upon POWs in a World War II Japanese prisoner of war camp. The camp inhabitants are building one link in the infamous Bangkok-Rangoon "death railway." Japanese overseer Captain Kanematsu (Henry Okawa): No time for jokes. Finish work...Dig dig. Here lies Corporal Herbert Thompson, serial number 01234567, valiant member of the King's own, and Queen's own, or something, who died of beriberi in the year of our Lord 1943. For the greater glory of...(pause) what did he die for?...I don't mock the grave or the man. May he rest in peace. He found little enough of it while he was alive. The camp's dutiful Japanese commandant, Colonel Saito (Sessue Hayakawa), is interrupted and told of the arrival of the battalion. In his bamboo hut, Saito is kneeling and dressed in a traditional kimono, with a Japanese print behind him. He hears the distant, insidious whistling, the tune of the "Colonel Bogey March," [which became one of the year's hit records] as the British troops approach closer to the camp, insolently announcing their arrival, swelling the sound to a rousing, defiant crescendo by the time of their appearance. Nicholson: My name is Nicholson. Saito: I am Colonel Saito. (He steps up on a box to view the prisoners and address them.) In the name of his Imperial Majesty, I welcome you. I am the commanding officer of this camp, which is Camp 16 along the great railroad which will soon connect Bangkok with Rangoon. You British prisoners have been chosen to build a bridge across the River Kwai. It will be pleasant work requiring skill, and officers will work as well as men. The Japanese Army cannot have idle mouths to feed. If you work hard, you will be treated well. But if you do not work hard, you will be punished! A word to you about escape. There is no barbed wire, no stockade, no watchtower. They are not necessary. We are an island in the jungle. Escape is impossible. You would die. Today you rest. Tomorrow you will begin. Let me remind you of General Yamashita's motto: 'Be happy in your work.' Dismissed! The malingering "Commander" Shears, shaving in the medical hut, has lied about his rank to get preferential treatment reserved for officers. He tells the touring Nicholson that he and the Australian are the only remaining survivors of the original POWs who built the camp: "Mostly Aussies, some Lime, some British, Indians, Burmese, Siamese...They died, of malaria, dysentery, beriberi, gangrene. Other causes of death: famine, overwork, bullet wounds, snake bites, Saito. And then there were some who just got tired of living." As Shears is examined by Army POW Doctor Major Clipton (James Donald) on a cot, he tells Nicholson: "Don't bother about me, Colonel. I'm not anxious to get off the sick list." I can think of a lot of things to call Saito, but reasonable, that's a new one. Shears: You just took my point. Here, there is no civilization. As an English gentleman, Nicholson insists that his men be treated as soldiers and that the officers serve only in supervisory capacities, according to the military code of behavior: "I want everything to go off without a hitch starting first thing tomorrow morning. And remember this: our men must always feel they are still commanded by us and not by the Japanese. So long as they have that idea to cling to, they'll be soldiers and not slaves." Shears knows better through experience: "I hope they can remain soldiers, Colonel. As for me, I'm just a slave, a living slave." Stoically and stubbornly, Nicholson keeps his men standing in the hot sun, rather than letting his officers work side-by-side in physical labor with the enlisted men. He cites Article 27 of the Geneva Convention to defend his principles. Equally determined in the stand-off with his armed men behind him, Saito slaps Nicholson across the face with the tattered book, drawing blood from his nose. Hours later at the end of the work day as the roasting sun is finally setting, the work detail of enlisted men are marched back to the prison yard. The defiant officers are still standing at attention in their same places (all holding fast to their positions - except for one who dropped to the ground from the intense heat). All officers are ordered to "the punishment hut" (or "the hole"), while Nicholson is summoned into Saito's headquarters. Hands raised, the men shout their support for their Colonel when he disappears inside. A few moments later, his legs limp, Nicholson is dragged to a corrugated metal-encased sweat box (called "the oven" by Shears) to be tortured under the blazing sun so that he will change his mind. The men pick up the tune: "For He's A Jolly Good Fellow" and then offer three cheers. Taking advantage of the situation, Shears successfully manages to escape from the camp into the almost impenetrable jungle (his two companions from the hospital, the Aussie Corporal Weaver and British Lieutenant Jennings are not so lucky), but he is shot and falls into a rushing river. Down-river, he manages to swim to safety. [Scenes of Shears' escape and struggles are alternatingly cross-cut with scenes back at the camp.] Construction resumes on the bridge, but progress is slow, ineffectual and behind schedule, fouled by accidental mishaps and engineering failures - without the presence of the morale-boosting commander. Clipton wonders to himself after having witnessed both colonels calling each other mad: "Are they both mad or am I going mad? Or is it the sun?" He gazes upwards into the blinding sun. Into the searing sun elsewhere walks a weakened and dehydrated Shears. Vultures begin to gather above him as he crawls through a parched wilderness. A vulture's shadow turns into a colorful kite (of a red-headed bird), the playtoy of some local village boys - he is rescued. In the camp, Saito addresses the enlisted men about a lack of progress in the bridge's construction - there are only three months remaining until the deadline. Saito announces that chief engineer Lt. Miura (K. Katsumoto) is "unworthy of command" and has been removed from his post. The men are given a day's rest ("All work and no play make Jack a dull boy," rationalizes the ingratiating Saito) and mail (and Red Cross packages) are delivered to them. However, they will begin all over again the next day with Saito personally in charge of the bridge construction.